I am continuing to machine quilt my St. Louis block from Pat Sloan's 2014 Globetrotting block of the month. Let's consider the plan "fluid" at this point. I'm not sold on the quilting in the light green triangles. I'll post another quilting video next week. Stay tuned! I recently finished filming a Craftsy class!!! You can't buy the class yet, but you can enter for a free chance to win it! Click HERE to enter. Good luck! 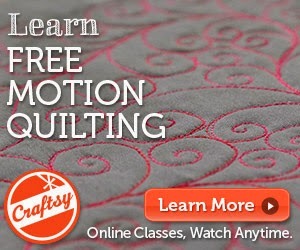 I filmed a Craftsy class! but these techniques can be used on a home machine, a sit-down longarm machine, or a longarm machine. If you would like to be entered in a drawing for a free class, click HERE! I am nearly ready to reveal the top-secret project I've been working on in recent months. If you've been guessing unsuccessfully, I want to give you a clue. Please submit wild guesses in the comments. My hotel internet service was non-existent. it is my firm belief that if I spend four days in a hotel without internet service, that hotel should be on a beautiful beach on a remote island. Alas, I am in Cleveland within spitting distance of the airport. I called the hotel's computer people every day and each day convinced them that "It's not me, it's YOU." Each day they agreed (eventually) and said that they were working on it. While I was in internet withdrawal, I couldn't indulge in my beloved Netflix. I found Raiders of the Lost Ark in my laptop's disc player and watched it 3-4 times this week. I watched that movie when it was in the theater and probably once or twice right after the DVD was released. This intense re-watching was like watching it for the first, second, third and fourth times. I love watching older movies and noticing new things. Indiana Jones' guide at the beginning of the movie was Alfred Molina? I looked it up (on my phone!) and saw that I was correct. It was his first movie role. As I am praying to find some stray wifi to upload this post, I am realizing that I am addicted to the internet. I'm also addicted to oxygen and water, so I'm not saying it like it's a bad thing. I am addicted none the less. Take me away, Harrison Ford! I don't know how I got so lucky. I love my job and work with amazing people. I met up with a bunch of them at Quilt Week in Lancaster, PA last week. These lovely ladies sent me home with suitcase that was heavier than when I arrived. Will I see you there? Will the snow at my house finally be melted by the time I get back to New York? Or, please no, will more snow fall while I'm away? Check my calendar for a full list of my events. I hope to meet up with you soon! Preferably somewhere warm. I am happily working on my Pat Sloan Globetrotting block of the month I'm currently quilting St. Louis. I decided to start with the straight-line quilting. In this block, the straight lines are the stitch-in-the-ditch around the orange square and "V"s stitched in periwinkle and cream squares. I didn't quilt the straight lines in the large light green triangles, because I am not convinced that is how I will end up quilting them. Oh, the indecision! The next video shows the "V" in the cream squares. I filmed it as a separate video because it can be tricky quilting points at the edge of a quilt or quilt block. I tape the edges of the block with quarter-inch tape so I don't accidentally quilt into the seam allowance or under the binding. You could use any marking tool, but after years of trying different methods, this is the one I like best. Stay tuned for another video next Tuesday! Subscribe to my blog so you don't miss any tutorials. Not all of my sewing projects are pretty. Some are simply useful. Mom loves getting handmade gifts from me. I'm a mom; I get it, so I oblige. I layered them with old towels (from my wedding shower nearly 30 years ago) and quilted them using my walking foot on my home sewing machine. I bound them up with some leftover quilt bindings. Happy cooking, Mom, Love ya! National Quilting Day -- What Did You Do? Yesterday was National Quilting Day. I usually teach on National Quilting Day, but this year I was at home. I was able to spend all day in my sewing room putting thread to fabric. It was Wonderful! While He-Who-Must-Not-Be-Named was regaining his power, I grabbed the leftovers from this quilt. I simply adore Joanna Figueroa's Day in the Country Line, and all her other fabric lines, too! I measured carefully and determined that I had just enough fabric left to make another Squared Away quilt. Is it wrong to say that I love this pattern? I've designed many quilts (and I love them all equally!) but this one is really one of my favorites. I have 30 blocks and hope to join them all together while Harry Potter defeats Lord Voldemort. Oops! I hope I didn't spoil the ending for anyone! How did you spend National Quilting Day? I am working at home this week. Some folks think that means I have a week off but that is the furthest thing from the truth. I am finishing up some pattern tests, making a few pattern samples, working on new pattern designs, and doing a lot of paperwork for past and future travel. I have a fire going in the fireplace and I love these cozy days in my sewing room. To accompany all of the work, Spring threw us a late snowstorm. I hate snow. I really, really do. To help me enjoy the work while ignoring the snow, I drafted my dear friend Harry Potter for help. I've read all of the books (more than once) and this week I'm hosting a sewing room Harry Potter movie marathon. A friend joined me yesterday, but today I am once again on my own. Have you seen the Harry Potter movies? Does this quilt block look like Gryffindor? This block will make its debut in a future Cutie quilt, tentatively named "Vintage." I have belonged to my local quilt guild for about 20 years. These delightful ladies are dear to me. This week's speaker was the fantastic Linda Hahn. She gave a great trunk show/lecture on Wednesday night and had scheduled an all-day workshop on Thursday. I knew about the workshop but never signed up. I have a lot of work to do on the rare days I am at home and I didn't want to start a new project. Also, Thursday was my wedding anniversary. I told all of this to my guild ladies, but did they care? NO! They beat me until I agreed to sign up for the workshop -- 11 hours later. I ran home from my guild meeting and had to gather all of my supplies, pre-cut fabrics, and grab a few hours of sleep. ZOOM! 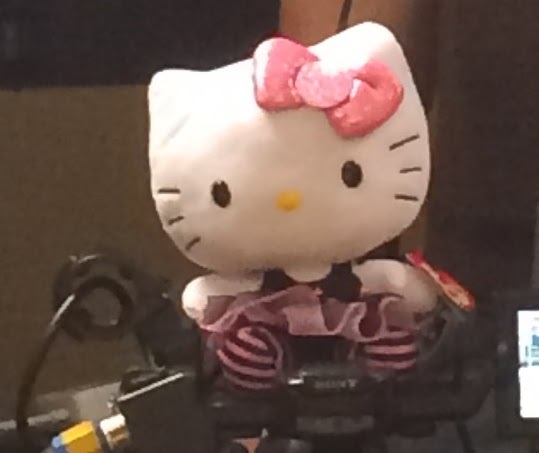 Doesn't everyone have a full bolt of Hello Kitty fabric? No? Odd. I think I may have frightened a few other quilters, but I was in Hello Kitty heaven ALL DAY LONG! We were piecing quilts from Linda's first book, New York Beauty: Simplified. I finished 4 blocks of 36 and I LOVE THEM! I can't wait to finish this quilt because it is for ME! Mine, all mine! If you ever get a chance to take a class with Linda, jump on it. Don't wait for your guild ladies to beat you. I spent last week at Quilt Week in Lancaster, PA. Other than starting the week with a bad cold, I had so much fun! 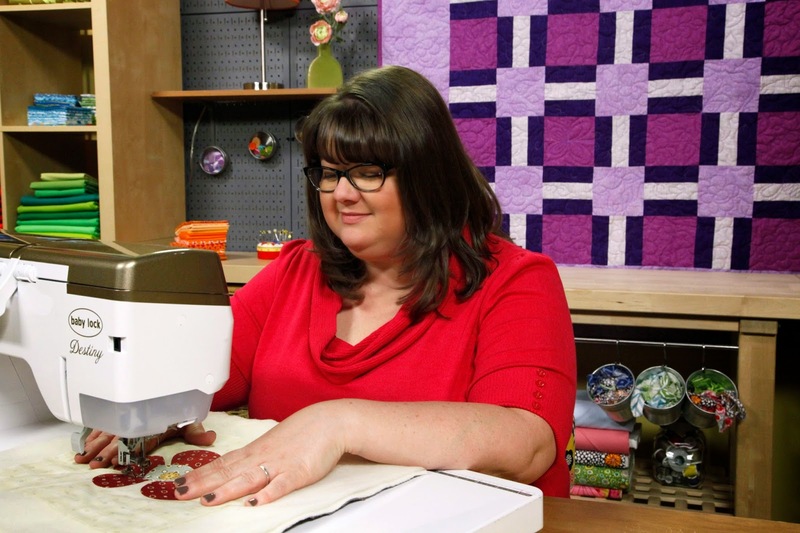 This woman is an Ah-Ma-Zing quilter and I'm thrilled that she won! I met up with so many wonderful friends and students at the show, but it was crazy-busy and I barely got to say "Hi!" I was still rocking the deep voice in that interview and WOW! I talk fast! and am now in the middle of a whole week at home! Wheee! Fabric is flying here in my studio and I can't wait to show you what I'm doing. Soon I will leave for OSQE in Cleveland, OH. Will I see you there? Check my calendar for a full list of my classes. I hope to meet up with you soon! I will be even more thrilled when I get a nice sunny day to take glamour shots of my quilts! Oh Spring, where art thou? This latest pattern is called Jack's Star. I designed it as a memory quilt for my dad, Jack, who passed late last year. I have boxes of his plaid shirts and will make memory quilts in this pattern for his grandchildren, but I am not yet ready to cut into them. While I am waiting to make the memory quilts, I chose to work with Tula Pink's Bumble fabrics. This pattern and that fabric are such a sweet combination! And since I love to machine quilt, this pattern allows tons of space for fun quilting! Have you seen my other patterns? Any Cutie pattern works with any Cutie pack of fabric. You can mix and match to make the quilt yours! I am happily working on my Pat Sloan Globetrotting block of the month and this month is the block named St. Louis. I covered my block with Quilter's Preview Paper and drew quilting designs on the paper with a Sharpie. Note: I did NOT draw on my quilt block. You can breathe now. The rest of the block, however, wasn't obvious to me. I just stared, hoping that inspiration would strike. How about swirls in the cream triangles, pumpkin seeds in the dark green/cream half-square triangles, and straight lines in the large green triangles? I'm not convinced that the straight lines in the light green triangles are the right choice. What if I divided the triangles into sections and then filled the sections with ribbon candy? Now that I see them drawn out, I definitely like choice A better than choice B, but I'm still not convinced. I may not know what I'll choose until I actually quilt it, but at least I can start quilting the rest of the block. Quilt of the Week -- Starring Frank! I have been trying to get to the bottom of things lately, and by things I mean the piles in my sewing room. I pulled out an old quilt in process. A very, very old quilt. I started it for my daughter years and years ago. I showed it to her now and received the "no thanks" answer. Her loss! I'm keeping this one! The pattern was a free online pattern from Judy Laquidara, but I think she's taken it down in the intervening years. I love the fabrics in this quilt. The print is based on the work of Frank Lloyd Wright, the green is a Pepper Cory fabric, the dark blue is a Quiltmaker's Gift fabric, and the white is a P&B. I have no idea what the light blue is, but it's beautiful, too. I was tickled to have enough fabric left to make matching pillowcases for my bed. This quilt is snuggly and warm and has brightened this long, long cold winter in New York! Once I get home today, I'll unpack, start laundry, and get organized for my at-home work week. Soon I'll be home. I love home! I often listen to audio books whilst I'm quilting, and last week I finished "Rose Under Fire" by Elizabeth Wein. This is her second (latest) book in her Code Name: Verity young adult series. I enjoyed the first book and downloaded the second book without reading the description. I don't read books about German concentration camps and I don't watch movies about them, either. "Schindler's List"? Nope. "The Boy in the Striped Pajamas"? Yes, but it nearly killed me. I would have known to avoid "Rose Under Fire" had I simply read the blurb! I started the book unaware that it would take me to Ravensbruck and when I figured it out I was too invested in Rose to close the book. One of the reader's voices was annoying, but I can't imagine how difficult it is to read an American accent, a British accent, a Scottish accent, a Russian accent, a Polish accent and many German accents, too. This is a good series, but if you, too, can't read concentration camp books, consider yourself warned. I am having a BLAST at Quilt Week in Lancaster, PA. I really, really, really love working in the Handi Quilter booth. I love being happy with my co-workers and the quilters. My life is pretty perfect. 1. iPhone charging cord. No explanation necessary. 3. Hand-sanitizer. My cold is almost gone, but not totally. I will share almost anything with quilters, but I really don't want to share my cold. Also, I don't want anyone else's germs. 4. Tylenol. If you don't know what that's for, you haven't stood on a concrete floor for hours and hours and hours. My dogs are barking and my knees and back are making some noise, too. I've worked at enough quilt shows to know that Tylenol is a quilt show MUST HAVE. 5. Lip Gloss. Have you ever talked all. day. long? How about day after day after day? My lips get ridiculously dry and EOS is my current fave. Honeysuckle honeydew, specifically. Pro: They have a stylus for touch screens. I need those because touch screens hate me. Con: Everyone who sees it wants to steal it. I travel a lot for work. A Lot. No, really, I mean A LOT. Flight days are hard, especially during this last winter. I'm usually grateful when I land and think "Phew, the hard part is over!" This is not always true. We all agree that Talenti has medicinal qualities, right? As I tried to ease my suffering, I packed my tissues, cold medicine, bleach wipes, and hand sanitizer and headed to AQS Quilt Week in Lancaster, PA. I saw some friends and some awesome quilts. By the end of the day, I realized that this quilt show had nearly cured my cold. I'm still rocking the deep voice and bumping elbows instead of shaking hands, but I feel human again. Behold: the restorative powers of a quilt show! After this quilt show, I will teach at OSQE in Cleveland, Ohio. 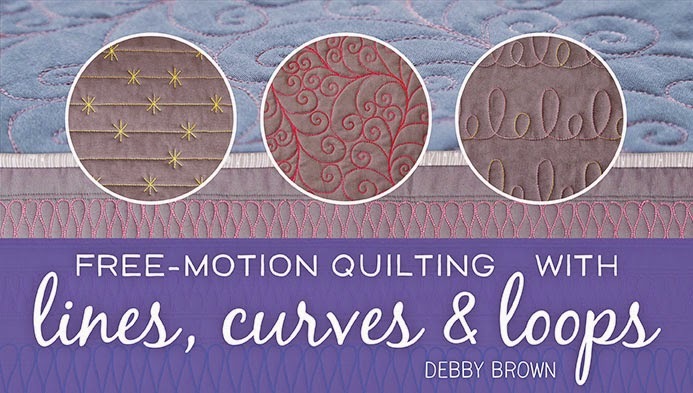 Also, there is still time to nominate/vote for your favorite machine quilting teacher here. Check my calendar to see if we can meet up some time this year. I haven't seen snow falling from the sky for a few days! That is my first hint that we may actually have a spring this year. This would be an excellent time to watch them. Soon, very soon, they will be gone. Vacation Time -- Surf's Up! I live in New York and we've had a ridiculously long, snowy, cold winter. I love thinking about warm vacations. This month's block from Pat Sloan's Vacation Time block of the month was a perfect anti-dote to winter! This block matches my Down by the Boardwalk block and my Toes in the Sand block nicely! I can't wait to see how they all look together. Now how shall I pass the time until April's block? I am so excited about this week's finished quilt! I am making the Aurifil Mini Quilts each month and I love February's even more than January's! Why oh why isn't the March mini quilt pattern available yet? Good thing I'm going to a quilt show tomorrow; it will distract me from my mini-quilt withdrawal. I am a quilter, which means I have a stash of fabric. It also means that I have a stash of thread. What you might not know is that I have a stash of batting/wadding, too. The batting/wadding stash causes me a bit more grief than the other stashes. I can decoratively display my thread on racks and I can fold fabric neatly and stack it in bins, but batting? It takes up so much space!! Shown: one bag of wool batting/wadding and one bag of cotton batting/wadding. Sorry for the horrible photo; it is winter here and everything is dark and shadowy. I can't wait for spring for many reasons, but good photographs are on that list! Once these leftover bits of batting/wadding fill a bag, it is time to join those bits together and make a large enough piece to use in a quilt. Looking at that photo, I'm ready to create a wool Franken-batt so the bag no longer overflows! I join my wool batting/wadding together with either a needle and thread or iron-on batting tape. I join my cotton batting/wadding together with either a zig-zag stitch on my sewing machine or iron-on batting tape. What do you do with your batting/wadding? Any fun hints to share? I've mentioned that I don't watch TV and it's true, but I don't sit and stare at my walls, either. I read a lot, watch (ok, binge) Netflix, and get information and entertainment in various formats. Are you a fan of TED? I downloaded the app on my phone and can listen to/watch a TED talk in the morning while I'm doing my makeup. I've learned some interesting things about stuff I would never have learned about this way. This week, I was really feeling the love. Some weeks are less wonderful than others for me, and this one was tough. These lovely folks didn't know it, but they all sent smiles my way to brighten my days. I taught at Sewing & Stitchery Expo last week and they have amazing volunteers. One of the volunteers running my classroom knit (knitted?) me a scarf! Thank you, Monika! I love it! Thank you, Charlotte! She makes me smile every time I see her! Hello Kitty fabrics and candy. I'm feeling the love, Deb! She was sure to tell me that this wasn't a hint about my bad manners. Cindy, thank you ever so much! I'm not sure what I did to deserve such wonderful people in my life, but I'm feeling the love, y'all. It definitely added some sparkle to this week! Quilt Shows Rock My World!